Time and place : 03/ 08 / 03 Smithy Beck Walk, Ennerdale, Cumbria. 1 pm start. 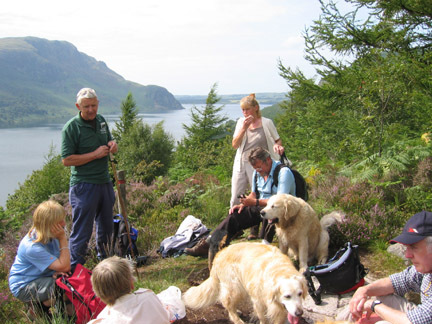 Occasion : A Voluntary Warden Guided Walk with Derek Tunstall, Gillian Thorne, Ann and our dogs, and four visitors. Weather :Warm and dry, with excellent sunshine by the end. 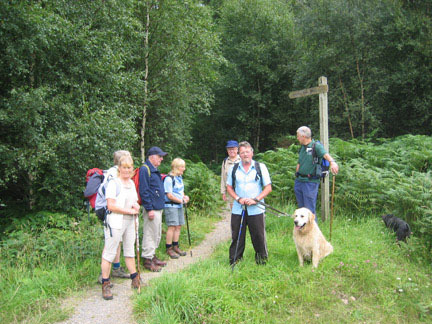 Walk details : Classed as a 'moderate' walk due to the unpredicatable forest paths. 2.75 mls, 500 ft of ascent, nearly 3 hours including stops. 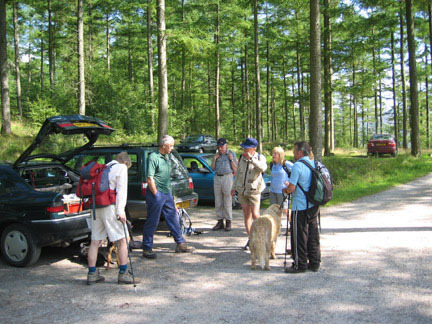 Meeting at the car park at Bowness Knott, we got to know the visitors who had joined the guided walk, and explained the nature of the walk, and a few of the sights we hoped to see. and Steeple (centre) the pointed outlier of Scoat Fell (to the right). one of the few remaining signed routes in the valley, due to the on-going forestry work. Dry Beck Bridge, and shortly after, the view of the falls on Smithy Beck itself. The route here was through mature mixed woodland. A clearing in the woods, near the area marked as settlements on the 2.5 inch map, has the remains of old dwellings, summer sheilings perhaps, from centuries past. All that remains now are the collapsed walls of old homes, lost in the bracken. 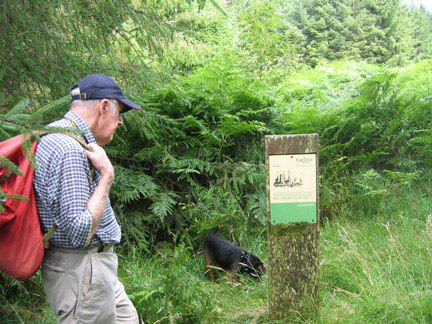 A sign gives an indication that they may have been associated with the old Smithy or Furness of Smithy Beck. Through the woods to Latterbarrow, one of many in the Lakes, but the only one with this fine view of Ennerdale. Dereck talking with the group. 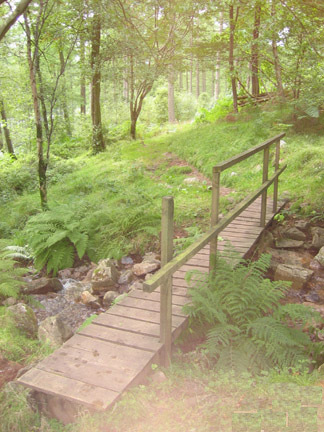 Many of the more well known Lakes Valleys have memorial gates, trees and benches to loved ones recently deceased. 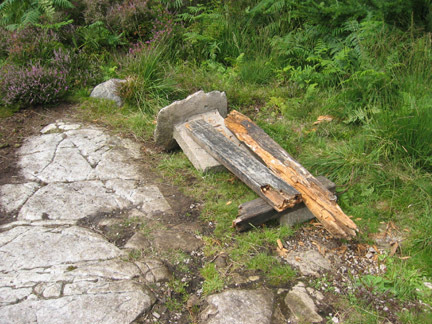 The seat at Latterbarrow is sadly in need of sponsorship . . . Any offers . . . . ? 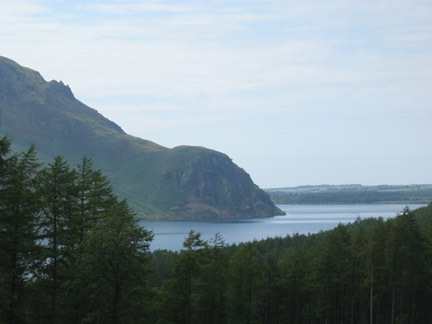 As we left the viewpoint there was a glimpse of Ennerdale's landmark, Angler's Crag. Back to Smithy Beck, this time down at the lakeside. Dereck and Gillian informed us that, in the trees to the right, was the sight of the Smithy Beck Furness, a charcoal blast furnace, designed to process the iron ore mined on the hills on the opposite side of the lake. A few years ago, the site was cleared of bracken and undergrowth to reveal some of the buildings, but nature has once again taken control. If you look carefully, a few traces of iron ore slag can be found on some of the paths. 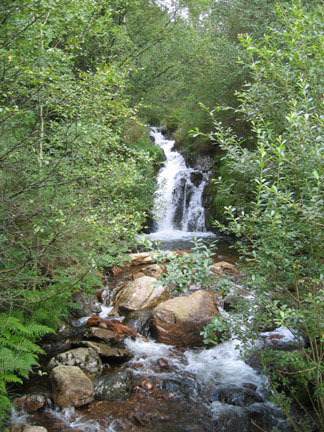 Today many of these areas have been dedicated as sites of special scientific interest. 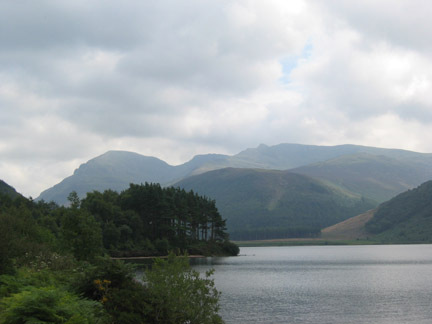 There's more to Ennerdale than meets the eye. A parting shot of the promontory, a favourite picnic area, now enjoying full sun. From there it was a short walk back down the lake to our starting point at Bowness Knott. 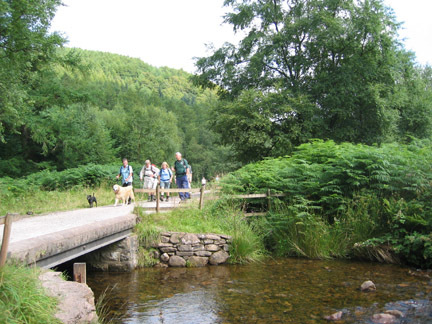 Link :- Lake District National Park main site. This site best viewed . . . after being there.